Power Cut Line has a full range of sizes and specifications for cutting steel, stainless steel, aluminum and non-ferrous metals. Discs are available for electric and pneumatic hand-held machines, portable cutting machines, angle grinders and stationary machines. Great cutting capability, comfort and clean cut are the main advantages of thin wheels, making them the perfect choice. One of the key features of Power Cut series products is the cold cut that prevents thermal deformation of the workpiece. 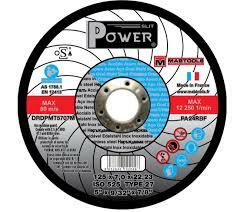 Power Cut Discs are the best choice for working on steel, stainless steel, aluminum and non-metallic materials. Chemically treated abrasive blends allow excellent performance, improving the elasticity and hardness of the disc. The power range is designed to be versatile, paying special attention to materials and applications. The disks are produced with high quality European raw materials, corundum and silicon carbide, mixed with resin bonds and special fillers. Reinforced fiberglass meshes are chosen for their quality and strength, resulting in maximum security when using the disc.